Amir is the privileged son of a wealthy businessman in Kabul, and Hassan, the son of Amir’s father’s servant are best friends. As children in the relatively stable Afghanistan of the early 1970s, the boys are inseparable. They spend idyllic days running kites and telling stories of mystical places and powerful warriors until an unspeakable event changes the nature of their relationship forever, and eventually cements their bond in ways neither boy could have ever predicted. Even after Amir and his father flee to America, Amir remains haunted by his cowardly actions and disloyalty. 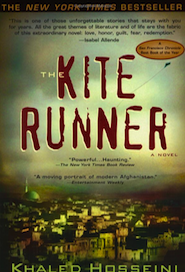 In part, it is these demons and the sometimes impossible quest for forgiveness that bring him back to his war-torn native land after it comes under Taliban rule. When Clay Jensen finds a package on his front porch, he’s excited. A package, for him? With no return address? What could it possibly be? What Clay finds is a shoebox full of cassette tapes, each marked as “Cassette 1: Side A,” “Cassette 1: Side B,” etc. Of course he rushes to the old radio/cassette player in his dad’s garage to check out these mysterious tapes.And soon wishes, wholeheartedly, that he’d never picked up that stupid package from his front porch. What he hears when he inserts that first tape is the voice of Hannah Baker. Hannah, the girl he’d crushed on for longer than he could remember. The girl he went to school with. The girl he worked at the movie theater with. The girl who had changed, drastically, in the last several months. Hannah Baker, the girl who committed suicide. Clay soon realizes that these tapes aren’t just a suicide note, aren’t, really, even a clear-cut rendition of why she did what she did. 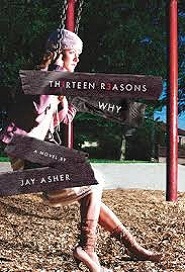 Instead, these are thirteen reasons — thirteen people, to be exact — who created a snowball-effect of events that led Hannah to believe that suicide was her only option. Connor’s parents want to be rid of him because he’s a troublemaker. Risa has no parents and is being unwound to cut orphanage costs. 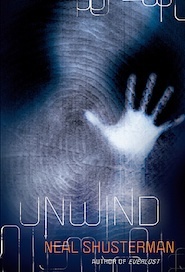 Lev’s unwinding has been planned since his birth, as part of his family’s strict religion. Brought together by chance, and kept together by desperation, these three unlikely companions make a harrowing cross-country journey, knowing their lives hang in the balance. If they can survive until their eighteenth birthday, they can’t be harmed — but when every piece of them, from their hands to their hearts, are wanted by a world gone mad, eighteen seems far, far away.